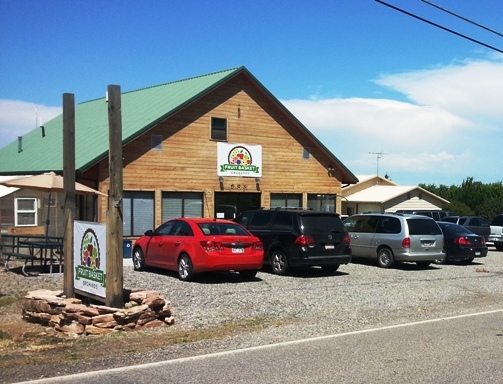 Welcome to Fruit Basket Orchards, the only full -service U-Pick orchard in western Colorado. Our motto is “pick, eat, repeat” and if it grows on our property, we’ll let you pick and take it home. We grow a little bit of everything, including all your favorite stone fruit (peaches, sweet cherries, tart cherries, nectarines, apricots, plums), raspberries, plus 18 varieties of apples. We also grow table grapes, and a few pears. We strive to provide the highest quality fresh fruit and products, excellent service, and a fun, safe and educational experience. Come see what makes us different! We’re easy to find! The store address is 253 32-1/2 Road, Grand Junction, CO 81503 or give us a call at (970) 434-3063. You are also welcome to come out during the week but we ask that you call first and make an appointment.